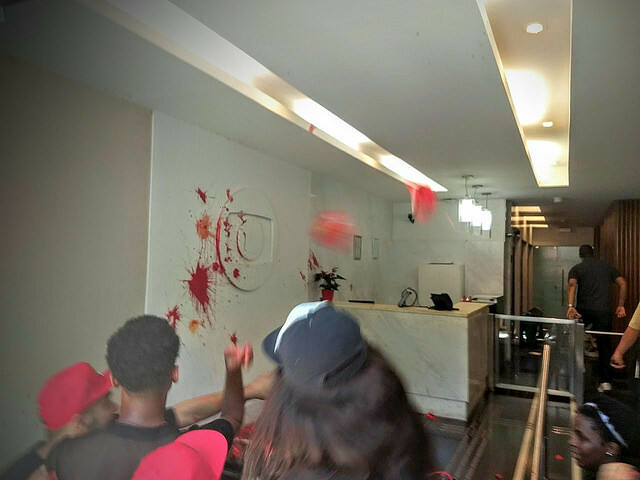 Protesters walked into the entrance hall of Rede Globo’s headquarters in the afternoon of this Wednesday (24) and stained the external signboard in red. The building’s occupation at Jardim Botânico, in Rio de Janeiro, lasted few minutes and was one of the demonstrations against the coverage of former president Lula’s trial, considered anti-democratic by popular movements. “A trial like this demands a radical response. We need to show that the people will not accept a conviction without proof. A juridical spectacle was created with full support from the Rede Globo. The judiciary branch would not support such unconstitutionality if it was not for the company acting behind the scenes. While Globo exists, there will not be democracy,” states Paulo Henrique from the Landless Workers’ Movement (MST). Popular movements claim that in case Lula is convicted by TRF-4, they will occupy the streets to guarantee that Lula have the right to be candidate. According to Luma Vitório, from Levante Popular, the articulation of the judiciary branch, the media, and the financial market will not be enough to prevent Lula from running the elections. “Lula willl be candidate and then will be elected, because the people know that the project they want to push extinguishes the Brazilian people’s rights. We will guarantee that does not happen”. The red paint on Rede Globo’s signboard ended the demonstration. Read this news in Portuguese and Spanish.